Author, artist, and counselor, with MEd in counseling psychology and MFA in fiber arts, Savitri is a recipient of Fulbright and National Endowment for the Arts grants. She has lived in ashrams in American and India over many years. "This work is quietly and splendidly mythic with startlingly apt turns and surprises." "I absolutely loved your book...!!! It gave me the feeling of actually being out there where you live...Can you write a sequel?" "I didn't want it to end." Are you writing a book or a magazine article? A musical? Do you need help with your story-line? Your character development? Would you like a little coaching on creative writing skills? Fiction or creative non-fiction--I'd love to work with you. 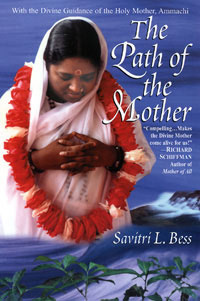 Framed by Savitri Bess's own years of devotion to one of the Universal Mother's most famous, contemporary incarnations--the Hindu mystic Ammachi. Interweaving Hindu myths with Savitri's own quest and those of others, she reveals this journey as an exodus from aloneness into integration of spiritual practices with a life grounded in love for all humanity and the environment. 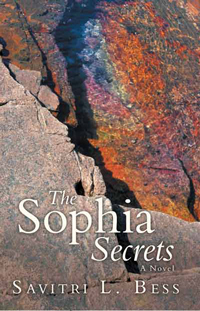 A magical realism novel of romance, goddesses, visions, and an elder's search for meaning. A coming of old age story, growing young in old bones. Set in a down-home village on the coast of Downeast, Maine. Featuring a writer, a mysterious old woman, an elderly man and his drug-addicted grandson. When writer Anne Demaree moves from New Mexico to a bungalow by the sea in Southwest Harbor, Maine, she hasn't a clue what is in store for her. After a life-altering experience at a Kali Temple in India, Anne is determined to get her life on track and so she prays to Kali. However, Anne neglects to take into account that you do not ask for Kali’s help without accepting the consequences. Kali is, after all, the Goddess of Transformation. A mysterious old woman bearing no resemblance to Kali, shows up while Anne is hiking on a mossy trail in Acadia National Park. The woman tells Anne she must follow her, because Anne is running out of time. Is the old woman real? Anne suspects the old woman is a forest being, kind of like you might find in Ireland. Whoever she is, the old woman keeps showing up in the most unusual places and times, with all manner of tricks to help pry open Anne's closed mind, even going so far as to call upon a few Indian goddesses. Bizarre sights to see amidst firs and birches while cross-country skiiing on a Carriage Road or rowing to a nearby island on the icy Atlantic. To complicate her life even further, Anne has found a tender love interest in Adam Waterfield, a retired philosophy professor and Cranberry Island native. A crisis with Adam’s drug-troubled grandson soon finds Anne at dead-center of the turmoil. Hickory Stroogle, a fantasy story set on an island in the Hebrides (long before the islands were known by that name). The story is calligraphed on handmade paper (abaca and cotton linter), illustrated with pulp painting, and put together in chapter book (accordion style and stab stitched). Click "Hickory Stroogle" link for illustrations and excerpt.